More than ever, I wish I owned the iPhone; not the iTouch. Evernote is one of those killer apps out there. I won’t spell its main features here. You should know them already. But let’s remember a few things. Evernote syncs your notes perfectly between each one of these platforms. And it’s very good at letting you organize your notes the way(s) you want. I have only scratched the surface, and yet, Evernote is already besting out a lot of those cool Information Collection applications out there, including OneNote, EagleFiler, Together, Yojimbo, et al. Evernote will let web page clips keep their whole visual identity. Everything – layout, fonts, colors, images – will look exactly the same as it looked in your browser when you clipped it. The guys behind Evernote recognize how important this is to us – they’ve already shown us their commitment to keeping a hi-fi visual identity. It’s great to see they’re continuing in this line. Evernote will let you keep more metadata about your notes. You’re already able to tag your notes. You’ll be able to write notes about some part of another note; so one note could contain many notes about it. And all of these metanotes will be non-destructive. At last, you’ll be able to use a yellow pen to highlight key points in text, for future quick reference, and improved, preferred search results. There’s many web products out there that have tried the annotation gig. If there’s one product that can at last solve it, it’s Evernote. That said, in this social era, I need to mention they also plan, of course, to put as much social sauce on these features as needed for us to thrive sharing our notes. I’m really glad about their plans. When these features will start showing up, I will at last be able to stop using delicious/diigo/etc. – Evernote will be much better at keeping my bookmarks, with their visual identity, their full text, and my annotations. In fact, Evernote will kind of become my personal documents’ replicated file system. I will use it every day, and will rely on it for so many things in my life that I will be glad to pay them a subscription. And you will, too. Oh, one more thing. These news might also come out as news to Evernote, the corporation. I don’t know if they knew they were planning these features; all I know is that if they didn’t yet, they now do. Do Macs really wake up faster than PCs? Doesn’t the following sound like an overloaded computer with insufficient RAM? “It takes 15 minutes to boot from the off position and 5-10 minutes to wake up from sleep.” – anonymous, 8th paragraph of this post on MacApper. Unbelievable. It’s not a computer, it’s a swaputer. I would definitely have to fight hard not to hate my employer if he forced me to use such a sluggishness. Or maybe it’s anonymous‘ fault for not recognizing the limits of hardware, for not ever refusing to install this neat new little, long-running, resident application. Anyway. Let’s tackle the heart of the matter. We switched to Mac in late 2007 and never looked back. We still have a late 2003 Windows XP laptop that we use every day while the other one is lucky enough to use the 24-inch iMac. I’ve always been wondering why Mac people keep saying Macs wake up from sleep faster than Windows PCs. Even my old Windows laptop wakes up in three seconds. Remember, that’s the benchmark of a 6 years-old model! Heck, our iMac is just two seconds faster at waking up! Now, were I to have a recent Windows PC whose hardware is on par with my iMac’s, I believe it makes sense it would wake up almost 100% as fast as my iMac, wouldn’t it? That said, I must confess a couple irregularities. Also, I don’t allow almost any kind of software to be always running, always present in the notification area unless it’s really always needed. So these two factors might account for our Windows laptop waking up so fast. And for all typically secured and app’ed Windows computer’s sluggishness at waking up from sleep. 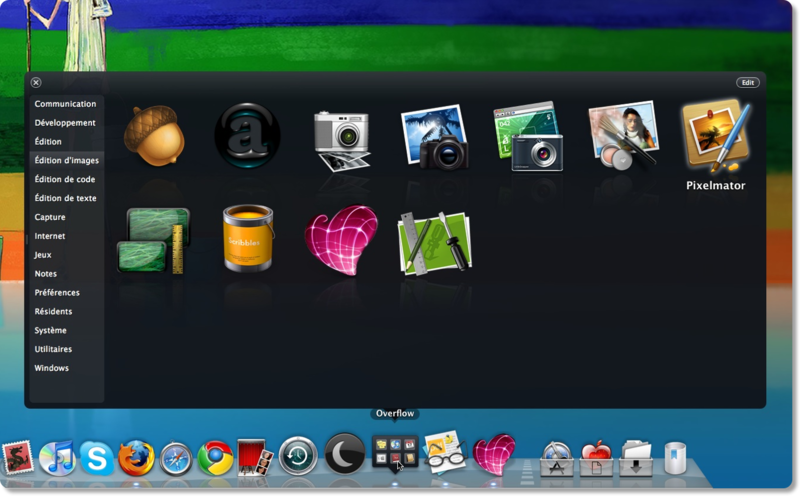 If you’re like me, you’ve got many applications on your Mac. Over the past two years, I have tried many applications to help me with the sheer number of applications I use. The one that I use the most often is Mac OS X’s own SpotLight. As you can see, I really need something like Overflow; and that’s why I wanted to write this review, as a big thank you to Stunt Software. I’m always on the lookout for a better wiki platform. Wikis have already had a huge impact, from pet projects to enterprise solutions to Wikipedia, the popular free online encyclopedia. Wagn could open up even bigger ideas about what online communities can do. – Ward Cunningham, who invented wikis 15 years ago. The trick is in the cards. Wagn helps you organize all your information into “cards” that can be linked, nested, and formatted to create new structures. “Kind of like online legos,” says Hoffman. A given web page might contain dozens of cards organized into a set structure. – Ethan McCutchen, Wagn co-creator. We’re all familiar with lots of kinds of cards: playing cards, postcards, business cards, library cards… They’re all different sizes and hold different amounts of information, everything from a picture to a filing record to a complete story. The same goes for cards on Wagn. As we started organizing cards of information about companies and products, we quickly saw patterns emerging. We wanted company cards, for example, to include logo cards, address cards, etc. This has been one of the driving ideas behind Wagn: cards including other cards in patterned ways. Also known as connections or connection cards, plus cards are one of the core innovations of Wagn. The basic idea is that any two cards can be plussed together to create a third. So for example, I might have a card about Dell Computers called “Dell” and another about labor issues called “labor”. If I connect these two cards together I get a third called “Dell+labor”. I can then enter into that card anything about the intersection of Dell and labor – Dell’s labor record in general, specific events, direct feedback, etc. Any time you see a + in the name of a card, you know you’re dealing with a plus card. And something else is worth mentioning too: Form cards. Wagn lets you create forms (called “cards”), and to apply a form to many cards, so that when you have a set of cards that are about the same kind of thing, you can be sure they will all contain the same information, in the same layout. Note that my screenshots don’t show the whole layout of each page. There’s also comment boxes there and the whole site navigation cards. Wagn is available as a paid hosting plan, or as a free, GPL-licensed open source Ruby code project. Oh, it’s far from done — we’ve got literally hundreds of design ideas in our tracking system (which we built using Wagn). Hat tip to Wagn 1.0+Press Release, The Story Behind Wagn 1.0, and the Documentation for most of the prose.